Home | Reviews | NES | Super Mario Bros.
Editor's Note: The NES Classic is officially back in stock today, so we're running our original review. Enjoy! Over the past couple of years, I've spent a lot of time writing about different ways to play classic games on contemporary hardware, because it's not as easy as it sounds. I've looked at clone consoles, heavily retooled vintage hardware, and crafty all-new solutions. All of them have had both plusses and minuses. Now, Nintendo has thrown its proverbial hat into the retro console ring, and their solution — the NES Classic Edition mini console — likewise has its own distinct advantages and drawbacks. After spending a day with it and putting both the hardware and its 30 built-in games through their paces, I've been impressed by what Nintendo has come up with. It's neither the least expensive classic console nor the most feature-rich. However, it strikes an appealing balance between affordability, content, and quality, making it by far the best low-cost classic game option currently on the market. 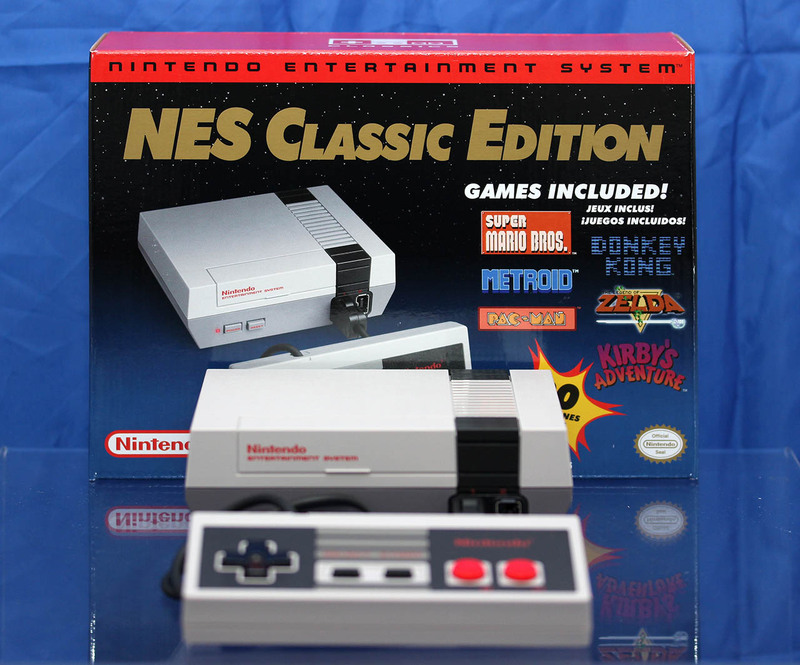 The NES Classic Edition is a sort of reproduction console, molded to resemble a miniature Nintendo Entertainment System — that grey-and-red workhorse that established Nintendo as a video games superpower three decades ago. 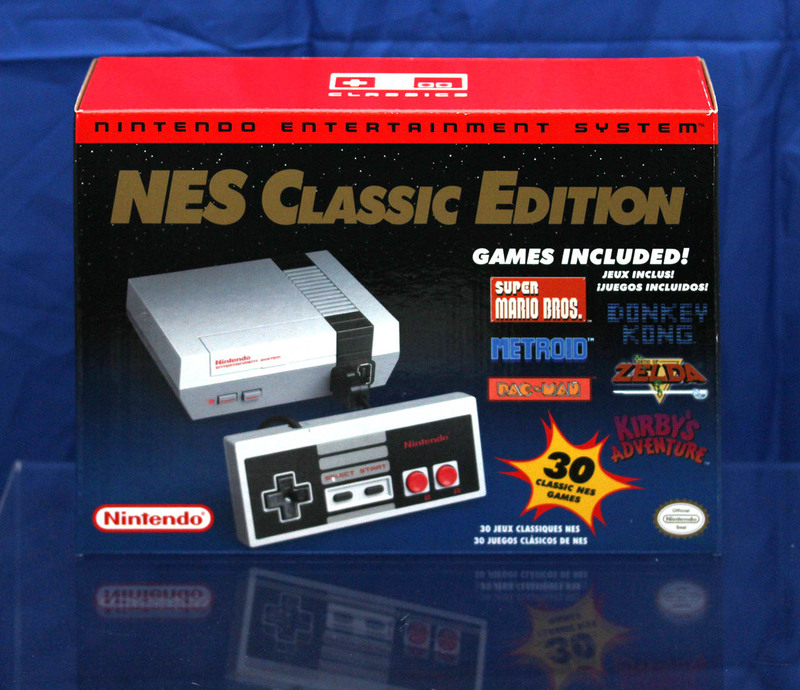 It comes preloaded with 30 of the most popular NES games of all time, a controller, a three-foot HDMI cable, and a micro-USB power cable/adaptor combo. Rather than go into exhaustive detail here, I will simply point you to a more convenient source for particulars on the NES CE: Our NES Classic Edition F.A.Q. (soon to be updated one final time! ), where you can find much more basic details and speculation. Probably the first thing worth discussing with the NES Classic Edition is what it doesn't do and doesn't include. Practically every conversation I've had with both casual and dedicated classic game fans about this mini-system has begun with a question ("Does it x?") and a regretful response ("Nope..."). The system does quite a lot for what you're paying, but it also lacks some basic features that undercut its value to the enthusiast crowd. If you're looking to this as a Virtual Console replacement, for example, you can expect to be sorely disappointed. The NES CE includes a single controller which plugs into a socket on the front of the system in the old-fashioned wired tradition. (It also supports a second controller, which is not included but will run you a painless $9.99.) The cables on these controllers are bafflingly short — a mere two and a half feet long, less than half the length of classic NES controllers. A short cable might have worked back then, when TVs were tiny and we all hunched close to the tube so we could make out what was happening, but the NES CE offers only HDMI output... which means it's designed specifically to play on giant televisions. You won't be sitting two feet away from your 65" set, so you'll need to set the system right next to you, outside your entertainment system, with its power and HDMI cables trailing messily across the room to snake behind your television. The stubby controller cables are a bizarre and unfriendly design decision that will greatly hamper the NES CE's utility in homes — certainly my plan to keep one under my living room television has been completely thwarted. The controller itself uses the Wii remote extension connector interface — not the Bluetooth-capable remote itself, but rather the unpowered dongles you could add. A huge and unfortunate miss. Because the NES CE perfectly resembles a tiny NES console, it immediately inspires the question, "Can I play my old carts on this?" The answer is no, because (as seen in the unboxing video above) two of the system's dimensions are actually smaller than those of NES carts. Carts literally wouldn't fit... plus, the cartridge slot flap is molded closed and doesn't open anyway. If you were hoping this system — which amounts to a self-contained NES Virtual Console — would allow you to go online and download more Virtual Console titles... well, you're out of luck. The NES CE offers no wireless connectivity at all — no wi-fi, no Bluetooth, not even infrared. Another big miss. The NES CE also doesn't include the ability to add games via SD card, or by dumping them into the system through a USB thumb drive. Unless you can somehow use QR codes to unlock secret games hidden inside, you are (as they say in the biz) S.O.L. The NES CE includes 30 games, and those 30 games are all you'll ever be able to play on it without engaging in legally dubious shenanigans. The first thing you see when you open the NES CE is a reproduction of the original poster that shipped with old NES consoles: A photo showing off the Zapper light gun and R.O.B., the Robot Operating Buddy. Neither of these items are included with the NES CE, and neither of the original peripherals work with the mini-console (nor does it include any compatible games, for that matter). What a cruel tease! I did set up my R.O.B. amiibo with the NES CE, though; even though it didn't work, it was still more fun than actually playing Stack-Up. Nintendo has hand-picked a limited number of games for the NES CE, and most of them are quite good; some even constitute all-time classics. There are some jarring absences (Castlevania and Castlevania II, yet not the masterful Castlevania III? Gradius but not Life Force!? ), but I'm pretty sure the curation was carefully calculated. There are enough games here to keep you entertained for many, many hours; a huge variety of titles (from early releases like Balloon Fight and Mario Bros. to end-of-life technical showcases like Kirby's Adventure); and yet the limited selection means you won't experience the same sense of overwhelmed fatigue that you can feel when you open up a folder of Every NES ROM Ever (Please Delete Within 24 Hours). It's psychology: Too many games would create the sensation that they have less individual value, and Nintendo depends on maintaining a sense of value for these intellectual properties. (Otherwise, how will they ever sell you these same games again on Switch!?) Plus, by lacking some obvious greats such as Mega Man III and Gargoyle's Quest II, they reserve the option to produce a second edition NES CE down the road. But seriously, between the Super Mario trilogy, the Zeldas, Mega Man 2, and several other top-tier classics, this is a great selection. Pity about the shoddy port of Ghosts ’N Goblins, but at least they were good enough not to inflict Urban Champion on us yet again. The NES CE's interface is one of its strongest points. It's streamlined to the point of hilarity — but in a smart, appealing way. Since you have only 30 games to choose from, they're presented in a linear gallery. But that single menu screen includes a lot of information and options, with all commands input simply though NES button presses. You can save up to four suspend states for each game, and you can lock each suspend state individually to prevent accidental erasure of your 10-hour Balloon Trip journey. And within this menu system you'll find all sorts of charming touches. Let the system sit idle and Mario and Luigi sprites will do battle, as they did on the idle screen of the Famicom Disk System. And to overwrite a save file, you select the one you want to erase and hold down the A button so that a tiny thumbnail of your current suspend point struggles and pushes the old file off-screen. It's these little details that make this feel like something more than just a big pile of ROMs. The NES CE ships with a single NES controller, and I'm pretty sure it's a real NES controller. The plastics feel the same, the button action feels identical; the only real difference is that the back plate has different patent and consumer warnings etched into it. I wouldn't be surprised if Nintendo dug up its old controller molds, or if they repurposed a giant cache of controllers they had sitting in a warehouse somewhere. You can use Wii dongle controllers, like the Classic Controller, but honestly the packed-in D-pad is the perfect way to play these games. That's a true rarity with devices like this, which normally ship with garbage controllers that go immediately into a bin somewhere. The NES controller included with this package may or may not be salvaged OEM goods from back in the day... but whatever its origins, its stubby, too-short cable hooks into the NES CE by way of the standard Wii remote extension adapter. That means you can use the Classic Controller (and many other extensions) on the NES CE. You should also be able to use the included NES controller for Wii and Wii U games that support adapters — I wasn't able to test out Smash Bros. for Wii U, but there's no reason it shouldn't work. If nothing else, the NES CE is just cute as a button. 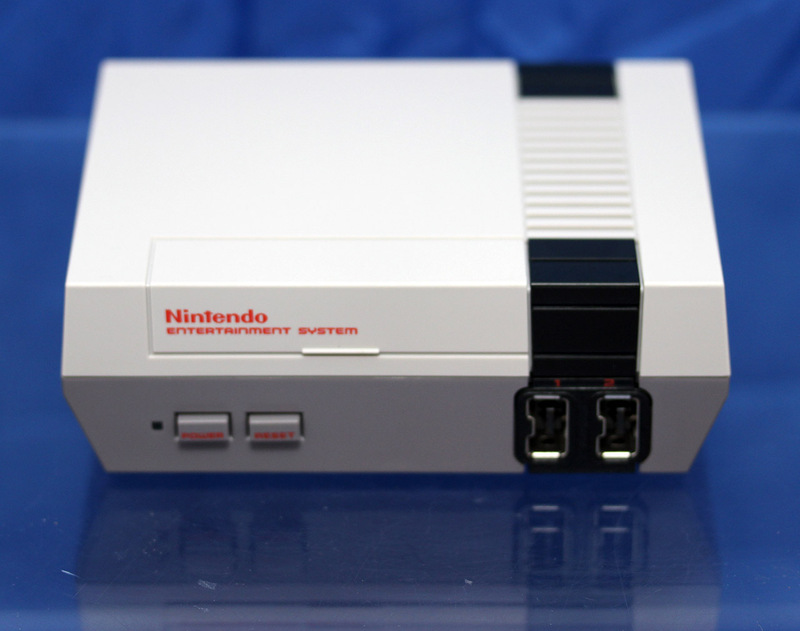 It's a near-perfect, tiny replica of the original NES, all the way down to the workings of its Power and Reset buttons. It even has a tiny red LED that lights up when the system has been powered on. For years, Japanese toy manufacturers have been producing miniature reproductions of classic game consoles; now we have one that actually works like the original console. More or less. It's a great, nostalgic conversation piece. Again, the NES CE is a charming little product. Pictures don't really convey its appeal; yes, it looks like a original NES console, and that's become a fairly mundane sight over the past 30 years. But once you see it in person, it minuscule scale becomes far more obvious — and more enticing. Just as tweed vests with bow ties go from nerdy to adorable when you put them on a toddler, the diminutive size and accuracy of this mini-system make it far more appealing than any other retro console product I've ever seen. The console's build quality lives up to its excellent appearance. Because it doesn't use the fragile zero-force insertion cart system of the original NES, and the front flap doesn't open, it's a dense and compact piece of gear. There's no flimsiness about this product — it feels like it could take a tumble off your desk (perhaps inevitably, given the short controller cables) and turn out none the worse for it. The NES CE doesn't completely reproduce the NES hardware, of course. 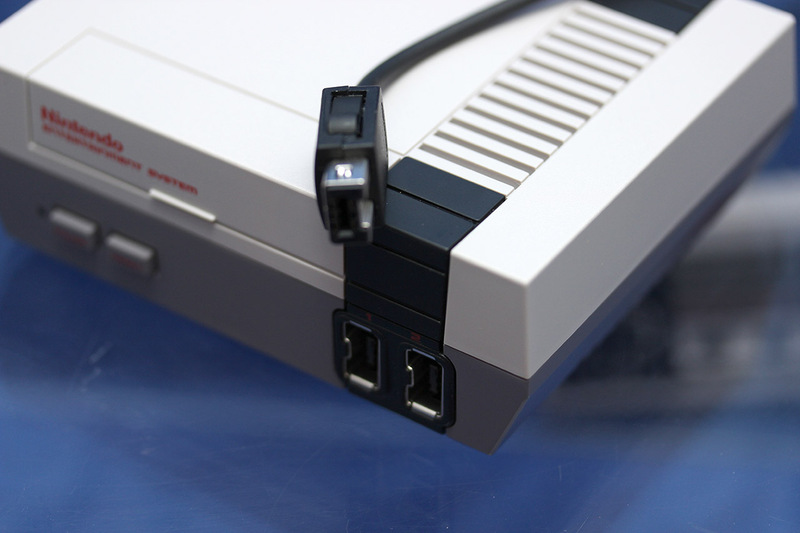 It uses a USB micro connector for power rather than a clunky AC adapter brick, and it drops the RF and composite connectors in favor of a single HDMI port. Likewise, the never-utilized covered port on the bottom of the original console has been abandoned like the vestigial uselessness it was. Whoever designed this managed to press all the right buttons, though. Literally! The action of the console's two face buttons feels just right. The Power button still works as a toggle that depresses slightly when active, while the Reset button doesn't toggle. Admittedly, the Reset button doesn't have as much depth of action as its equivalent on the NES, but its slightly shallow movement is hardly a deal-breaker. Resetting the system, incidentally, doesn't perform a hard reset on the console; it takes you back to the main menu, where your current game state is displayed in a tiny thumbnail overlay. This takes a little getting used to if you're trained to expect resetting the NES to perform a soft power cycle, and it's not as convenient as using a controller combo to reset as we're accustomed to on modern systems — but it works well, and creates a no-fuss, uncomplicated process. Tagged with mega man 2,	multiplayer,	NES,	NES Mini: Classic Edition,	Nintendo,	Reviews,	Role Playing Games,	Shooters,	Single Player,	Sports,	StarTropics,	Super C.